Wood ticks are a particular concern in grasslands between March and June. Churn Creek is a remote area with difficult access. The drive is long, so ensure that you bring sufficient fuel. Drive on open roads in the Churn Creek Protected Area at your own risk. They can become very slippery after any amount of rain, and washouts may occur. Avoid driving when roads are wet unless you are equipped with a four-wheel drive, shovel, and chains. Check road map for closures. Obey existing road closures. There is very little water at Churn Creek. Bring your own; don't rely on purifying surface water. Churn Creek Protected Area includes some of British Columbia’s rarest ecosystems – low, middle and high elevation bunchgrass grasslands. This unique and fragile landscape provides habitat for a diversity of rare flora and fauna. These grasslands can be viewed and accessed on existing cow trails and old roads. However, the trails are unmarked and unmaintained. The Protected Area abuts the west bank of the Fraser River, just south of Gang Ranch. Churn Creek Protected Area was established in 1995 following recommendations in the Cariboo-Chilcotin Land Use Plan. It is one of five large protected areas across BC that has been established primarily for the conservation of grassland ecosystems. The Protected Area also reflects the historic importance of the Churn Creek area to First Nations, ranching, hunting, mining, and recreation. This area supports an operating ranch, where carefully managed cattle grazing continues. In 1998, the provincial government purchased the historic Empire Valley Ranch located within the Protected Area, and added the land to the Churn Creek Protected Area. Churn Creek Protected Area offers opportunities for hiking, horseback riding, wildlife viewing, mountain biking and nature appreciation. Low impact, dispersed, non-motorized outdoor recreation that does not detract from the values of the area is permitted, but recreation will be managed to protect the natural ecological integrity of the area. ATVs and motorcycles are prohibited, and trucks and cars must stay on existing roads only. Driving on the grasslands is strictly prohibited. Hunting is permitted at Churn Creek during the allotted season. Please consult and obey the British Columbia Hunting Regulations. Churn Creek Protected Area supports an operating ranch; watch for cattle and leave gates as you find them, either open or closed. Keep off the hayfields in the Empire Valley Ranch area, even when travelling on foot. Driving over the hayfields is an offence. Do not trespass on private in-holdings within the Protected Area. Changes to the hunting and discharge of firearms in the Empire Valley Ranch Corridor were made in 2015. Please use only weed-free pelleted feed for horses or purchase hay from the Empire Ranch headquarters, since import of weeds is a major concern in the Protected Area. To help prevent the spread of weeds, check that your vehicle, bicycle, horse, and pets are clean of vegetation fragments before you leave home. Many weeds stick to pant legs and other clothing; check clothing before entering the protected area in order to prevent the spread of weeds. Use only processed feed (pelleted) for horses, or purchase feed directly from the Empire Valley Ranch Headquarters. Bunchgrass communities provide excellent feed and cover for wildlife. However, non-native weed species can invade grasslands, particularly following a disturbance, and can severely degrade habitat values. Weeds such as cheatgrass can rapidly dominate large areas. Cheatgrass gets a “head start” by growing through the winter when bunchgrasses are dormant. Once established, its roots capture available water when bunchgrasses most need it in spring. Other noxious weeds to be aware of at Churn Creek are burdock, hound’s tongue, leafy spurge and blueweed. Knapweed is also beginning to appear in the Churn Creek area. 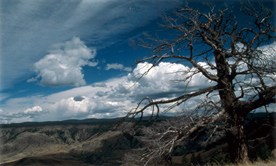 The Churn Creek Protected Area is situated approximately 60 km southeast of Williams Lake on the western bank of the Fraser River, south of the Gang Ranch. From Williams Lake, it is approximately a 2 hour drive. Churn Creek is a remote area with difficult access, involving several hours’ driving on rough clay and gravel roads, which become dangerously slick when wet. The easiest route from the Williams Lake area is to drive up Highway 20 approximately 3 km and turn left onto Dog Creek Road. Continue on this road until you reach Dog Creek Valley, then follow signs for Gang Ranch, which will take you across the Fraser River Bridge. At the next intersection, take the left turn onto Empire Valley Road. From the south, drive north on Highway 97 from Clinton; follow signs to Big Bar Lake Park. Turn right at the next T-intersection after the park. This leads you through Canoe Creek village and on to the Fraser River Bridge. Go left, as above. NTS 1:50,000 topographic maps of the area include: 920/8, 920/10, 920/9, and 920/7. The Churn Creek Management Plan has been prepared by BC Parks with the direct involvement of local First Nations and a local Advisory Group to guide management of the Protected Area. The area is managed for its nationally significant grassland conservation values, while the Empire Valley Ranch continues to operate at historic levels. Recreation includes access for hunting, horseback riding, and hiking, including a trail system to various scenic areas and a staging area for horseback riders. The approved Churn Creek Protected Area Management Plan is available in PDF format. Because of the large size of the file, the plan is divided into separate files for ease of access. Friends of Churn Creek Protected Area Society is a non-profit organization formed in 2009 to help BC Parks achieve the conservation and cultural heritage vision for Churn Creek Protected Area, as outlined in its management plan. Bicycles must keep to roadways. Bicycle helmets are mandatory in British Columbia.The terrain is suited to exploration by mountain bike, but you must stay on existing roads and trails. Do not be tempted to venture over grassland areas, as you can cause long-term damage to the lichen crust. Moreover, your tires can develop leaks from the spines of the tiny prickly pear cactus plants. Bicycle helmets are mandatory in British Columbia. Hiking is permitted on existing cow trails and old roads. Trails are unmarked and unmaintained. For your own safety and preservation of the park, obey posted signs and stay on the trail. Shortcutting destroys plant life and soil structure, particularly in the grasslands where the soil is only protected by the thin and delicate lichen crust. Horseback riding is very popular at Churn Creek. Horses must stay on trails and roads. The calving barn area with corrals and ample parking is suggested as a staging area for horses. Attention Horse Riders: Please use only weed-free pelleted feed for horses or purchase hay from the Empire Ranch headquarters, since import of weeds is a major concern in the Protected Area. This protected area is open to hunting and horses can be brought in for hunting. Please refer to the Hunting and Trapping Regulations for more information. If you must bring your dog to Churn Creek it must be under control at all times. It is illegal to allow your dog to harass livestock or wildlife. You are responsible for its behaviour and must dispose of its excrement. There are opportunities to cross country ski and snowshoe in the park, however, there are no set trails for these activities. There is a defined snowmobile access route through the park. Refer to the above Churn Creek park map that shows the snowmobile route marked. Empire Ranch operates within Churn Creek Protected Area and offers a rental cabin at the ranch headquarters. Campfires are permitted however, no firewood is provided. If you must have a fire in this dry, warm ecosystem, be sure to extinguish the fire fully. To preserve vegetation and ground cover, please don’t gather firewood from the area around your campsite. Dead wood is an important habitat element for many plants and animals and it adds organic matter to the soil. You can conserve firewood and air quality by keeping your campfire small. Be prepared to bring a portable stove for cooking. There is a day-use parking area with some area information and a pit toilet at the entrance to the Empire Valley Ranch Headquarters. It is far less developed than a typical picnic area. Overnight camping is not permitted in this area. This park only has pit toilets, no flush toilets. Pit toilets are located next to the kiosk at the entrance to Churn Creek Protected Area, at the calving barn and near the Empire Valley Ranch Headquarters in the day-use parking lot. This protected area offers vehicle accessible, designated campsites on a first-come, first-served basis – campsite reservations are not accepted. The park and camping areas are open year-round. The best location for camping is the calving barn area on Empire Valley Road. The only development (other than corrals and the barn) is a pit toilet – there are no defined campsites, picnic tables or fire rings at this site. There are 4 designated camping sites along the first 4km of the Black Dome Road and 6 designated camping sites near the top of the Iron Gate Road. These are rustic sites without pit toilets, picnic tables, or fire grates. The Iron Gate Road is not a serviced road and can be impacted by weather events year-round. Four wheel drive vehicles are recommended for travel on this road. Do not camp near the Empire Valley Ranch Headquarters area; this is a busy, working ranch. Do not drive or camp on any grassland areas with in Churn Creek Protected Area. The closest store is in Dog Creek, which is approximately a 45 minute drive away. Wilderness, backcountry or walk-in camping is allowed in this Protected Area, with the exceptions of all lands in and around the designated “No hunting or Discharge of Firearms or Bows” areas, and the Empire Valley Ranch Headquarters, during the annual, legal hunting season.